How can we creatively address food insecurity while reducing food waste using human-centered design? 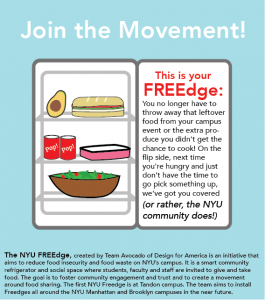 Design for America of NYU (DFA NYU) has been working for more than a year on a project (named NYU FREEdge) aiming to address food insecurity while at the same time reducing food waste by sharing leftover food with students who are in need. NYU FREEdge is a community fridge for which the DFA team created a web app in order to track food and provide users updates. Roughly a third of the food produced worldwide never gets eaten. And in the US while Americans are throwing out huge amounts of food, about one in every nine people in the world still suffers from chronic hunger—that is, insufficient food. Even in the United States, where that number is significantly lower, some 14 percent of U.S. households still struggled to put food on the table for a portion of last year, according to the USDA. Moreover, a recent survey at University of California unveiled that 40% of UC students do not have a stable source of high-quality, nutritious food. Yet, every year, 22 million pounds of food go to waste on college campuses according to estimates by the Food Recovery Network. 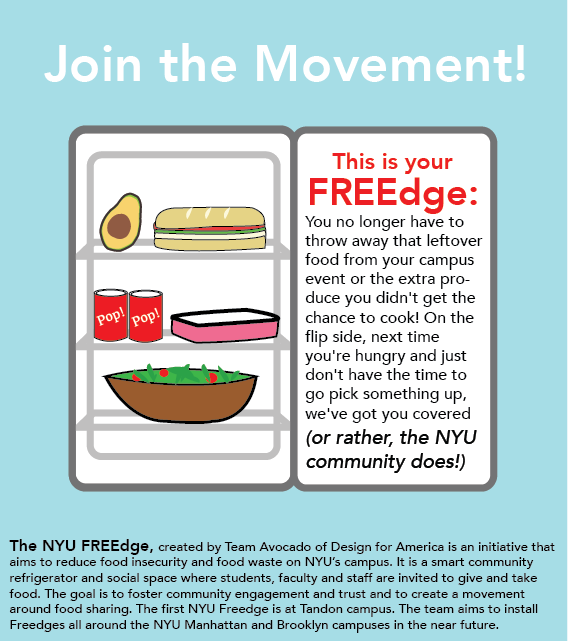 Inspired by these numbers, research that the team done, and other examples of community fridges in cities and campuses around the world, the project aimed to tackle food insecurity at NYU while reducing food waste by providing a community fridge the NYU FREEdge – to students. 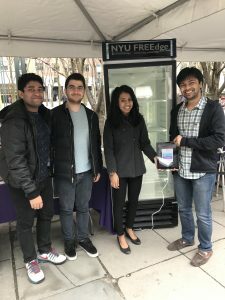 Based on some of our prototypes and users’ feedback, the team last spring felt that they had two options: either understand better issues around food insecurity and food sharing on campus (in particular anonymity, privacy as well as logistics and accountability) to develop FREEdges at NYU or partner with food pantries and create community fridges within the city to service local communities. As most of the team has graduated or moved to new projects, we are looking to put together a new team that can continue the project and explore one or the other options – that is on campus or in the community. In both cases, the issue of food insecurity and food waste are two major challenges in our world’s today and we believe strongly that it makes sense to combine both approaches: rather than reducing food waste, let’s use it and feed people who are hungry. We are currently looking to recruit a completely new team for the upcoming semester. We are especially interested in students who have a background in social work, public policy, food studies, engineering and UX, business, but we’re open to any and all hardworking team players with a passion for design and making the world a better place!